The Place We all know Seafood Paradise which started at Defu Lane many years ago from a coffeeshop ‘Zi Char’ to a full-fledged restaurant. We were surprised that the original Seafood Paradise outlet at Defu Lane has closed for good, where the group decided to relocated to a more swanky location – Marina Bay Sands. Opened about a few week ago, the new MBS outlet boasts eight private rooms and a main dining area. The Food We started with the Poached Canadian Live Clam with Chinese Wine in Claypot (S$38/small, S$57/medium, S$75/large), cooked with a broth of three types of Chinese Wine including Shaoxing Wine. I love the freshness of the clams soaked in the wine essence. Exclusive to the MBS outlet, the Pan-fried Australian Live Abalone (S$28 per pc/approx. 60g, S$38 per piece/approx. 120g) is a four-head abalone. One of my favourite dishes is the Braised Jade Perch with Supreme Soya Sauce in Claypot (starts from S$8 per 100g, depending on type of fish chosen). The sauce was the winning formula for me, which has a tinge of spiciness to compliment the fresh sea perch. The Crispy Kang Kong topped with Cuttlefish in Homemade Seafood Sauce (S$14.80/small, S$21.80/medium, S$28.80/large) has long been one of the signatures at Seafood Paradise, and we can understand why. I am personally not a big fan of the cuttlefish, but the crispy kang kong is definitely something unique and not seen in most local ‘Zi Char’ stalls. One advice is to have this dish quickly while the kang kong is still piping hot with that crunchiness. Of course, no visit to Seafood Paradise is complete without ordering their signature crabs. As opposed to the Singapore Chilli Style Sri Lankan Crab (seasonal price), our top pick lies with the Signature Creamy Butter Dungeness Crab topped with Coconut Crumbs (seasonal price). This has been our all-time favourite crab at Seafood Paradise. The luscious creamy butter sauce is an additive potion. Do not forget to have them along with the Deep-fried Buns (S$3 for 4 pieces). If crab bee hoon is your calling, we were also very impressed with the Wok-fried Bee Hoon with Sri Lankan Crab (seasonal price). 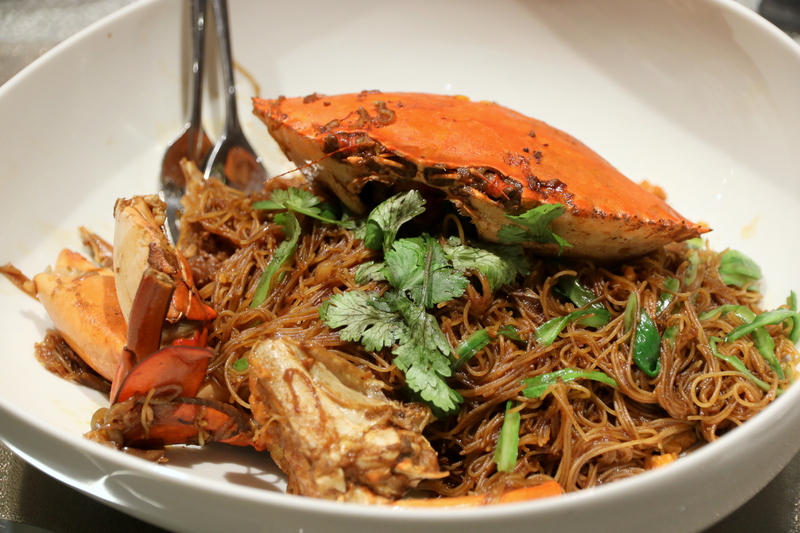 The bee hoon has a nice moist texture, effectively soaking up all the essence of the crab, giving it a tasty ‘wok-hei’ flavour. Rants As compared to its previous Defu Lane or Singapore Flyer outlets, the main dining space is comparatively smaller at MBS. The location at level 2 of the mega mall may prove to be challenging to locate as well. Reservation is highly recommended. Will I Return Again? When we think of a good seafood restaurant in Singapore, Seafood Paradise is inevitably one of the first few names to cross our minds. Stick to the signature dishes and you will be unlikely to go wrong. Seafood Paradise also has an outlet at Changi Airport Terminal 2. Make your reservation instantly at Seafood Paradise here.